I visited New Orleans in 2009 and was confused: the address of Lee Harvey Oswald was 4905 Magazine Street, but I couldn’t find a house with that number. Walking from the corner of Magazine and Upperline Street, you’ll find the odd numbers 4901 (uninhabited for years), 4903, 4907 and 4911 easily on your right. Where was 4905? I took several photo’s like this one, of 4907 Magazine. Was this the house where Oswald lived from may to september 1963? Back home I soon learned that it wasn’t. And in 2013, I went back. How stupid was I in 2009. I did not notice the small cottage on the right of 4907, a small appartment almost completely obscured by fence and foliage. Harold Cavilliere, owner of 4911, confirmed to me: “Yes, that’s the house where Oswald lived. My daughter owns it now. It’s kind of a shotgun house: not that big.” Harold is a World War II vet, known in the neighbourhood for his weekly saturday yard sale. He was kind enough to let me take pictures behind the foliage; his daughter wasn’t home, so I didn’t get the chance to look inside. Look below for some of my photos. 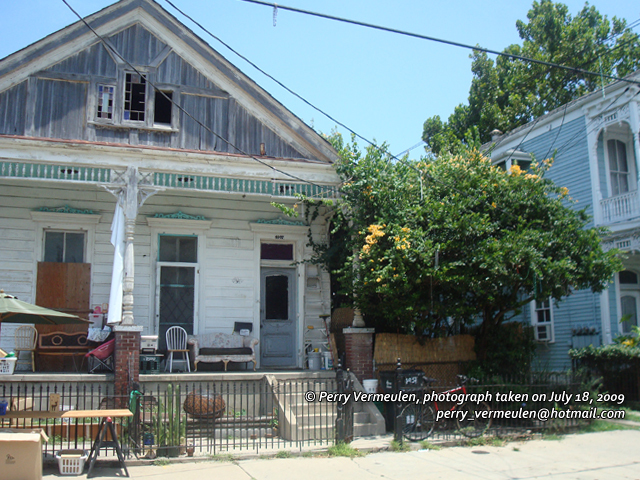 Number 4911 Magazine Street consists of one-half of a house located at 4905–11 Magazine Street. The other half of the house is divided into two apartments which go by the number 4905 and 4907 Magazine Street. Lee Harvey Oswald occupied the apartment known as 4905 Magazine Street from May 9, 1963, to on or about September 23, 1963. He paid a rental of $65.00 per month for the apartment, which was furnished, and was directly responsible to the utility company for payment of gas and electric bills. I never personally observed anyone visit Oswald or his family during the time they lived at the above address. Oswald never seemed to respond to greetings from me and seemed to be an unfriendly type of person. When living here, Oswald visited two bars regularly. I visited both of them – one even has a plague on Oswald’s favorite corner stool. More on this in a future blog. There are a great deal of things to learn out there but with time passing by & our government steadfast secrecy & compulsion for deception we will never know the real truth. I wonder if anyone has ever offered a New Orleans JFK assassination tour, visiting all sites involved?